Build-a-Bear Workshop, Burlington Stores and the Cheesecake Factory all have a common trait when it comes to their impact on women – and it’s not indulging their predilection for sewing, shopping and sweet desserts. They are, in fact, ranked among the 100 best large workplaces for women in the US, according to workplace experts at Great Place to Work. Their 2018 list includes just one commercial real estate company – Texas-based Camden Property Trust, an apartment REIT that placed No. 55 on the list. Of its 1,500 US workers, 46 percent of Camden employees are female; 66 percent of non-executive managers are women, and 32 percent of executive positions are held by women. To be fair, the real estate sector is working on it. But numerous reports highlight gaps not just in pay, but in seniority and support. Some 87.2 percent of women surveyed by the recruitment firm RETS Associates last year agreed, or strongly agreed, that the biggest challenge facing women in CRE today is equal pay. Lack of promotion opportunity is the number two gripe and lack of respect for their work is number three. The same survey found that half of all women working in commercial real estate have experienced sexual harassment at one point in their career and, sadly, most failed to report it. As we celebrate International Women’s Day, it’s time to step out of the shadows and apply ourselves to fixing this – and you know we can. That’s because while men have bigger brains than women, ours are better. The theme for IWD 2019 is #BalanceForBetter, a nod to the growing global push for professional and social equality. The intent is not just to encourage better balance in boardrooms, but across all spectrums of our lives. Now, before you say, “But what can I do, I’m just the secretary,” or just the associate, the analyst, the friggin’ receptionist. This one is on all of us, from CEO to cleaning lady. For inspiration, let me throw out a few names for you. What about Ursula Burns. Raised by a single mom in the Baruch Houses on the Lower East Side, Burns went from being a summer intern at Xerox to the first black woman CEO to head a Fortune 500 company. Pakistani schoolgirl Malala Yousafzai stood up to the Taliban and became a global advocate for women’s rights. Need another? 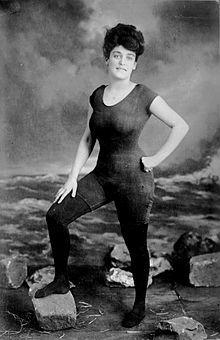 Rosa Parks, Annie Oakley, Madeleine Albright, Billie Jean King, and let’s hear it for Annette Kellermann, one of the first women to wear a one-piece swimsuit. The Australian swimmer was arrested for indecent exposure in 1907! Do your homework: If you are applying for a new job, or pitching a deal, research is key. Compare commissions and salaries at different companies and find out who promotes gender equality. Many companies actively recruit women and minorities, but you don’t want to be there just to keep the numbers up. Employees need to know how much money they should be making. Ask for more: The research shows us we are paid less than men, but it also tells us we find it harder to ask for more. The boss isn’t going to come running in with a raise because it’s the right thing to do. Pluck up and state your case fairly and frequently for the compensation you deserve. Push hard and early: Survey’s show that the gender wage gap it at its narrowest among women in their late 20s to early 30s, before they start a family. If you push for promotion early in your career, you will be in a better bargaining position after you have your children. Lead by example: Stand up for yourself and those around you. When you believe someone has been overlooked or underpaid, speak out, make a fuss, challenge the status quo and those around you will rise with you. Nothing will change if we turn a blind eye to it. Talk About Yourself: Don’t be afraid to tell all and sundry how you have succeeded at a challenge, accomplished a company goal, produced an award-winning campaign. Women are too shy about sharing their accomplishments – and look where it’s got us. Go on, blow your own trumpet, because self-promotion lets those in positions of power know what we have achieved. Be a mentor: Be a woman who supports other women. Let those around you know you have an open door to discuss any situation and collaborate with other women on projects and deals. Offer professional feedback and motivation that will help the women around you be better and stronger than they thought they could be. Change the conversation: If your company lacks equality, start engaging your colleagues in discussions about change. Hold staff meetings to brainstorm simple ways your work environment could be improved. Present employee suggestions to management and advocate for that change. Share stories from different companies and even countries where output has improved as the workplace has been balanced equally. Balance is not a women’s issue, it’s a business issue. Don’t apologize: Women have been conditioned to say they’re sorry, but out there in the business world, it’s viewed more as a sign of insecurity and self-doubt. It also takes the impact out of the words when you really mean them. Don’t be afraid to stand behind your actions and keep sorry for when you really mean it. Do it all over again: Repetition is the key to change. The more we speak out and act against inequality, the louder our voice becomes and the more people who hear us. On this International Women’s Day, some us will be building bears, some of us will be wearing coats, some might even be eating cheesecake, but all of us can make a difference.